Wow!!!! Did you find anythingy good??? PeeS Ummmmm, are they fur hire and are they any good at opening fridges???? Oh yeah! Get it, kitties!! Uh oh….looks like these cat burglars are going to get all the loot!! How will you spend all of the money you found?! So whatever they find, they can transfer to their own account? Lucky kitties. 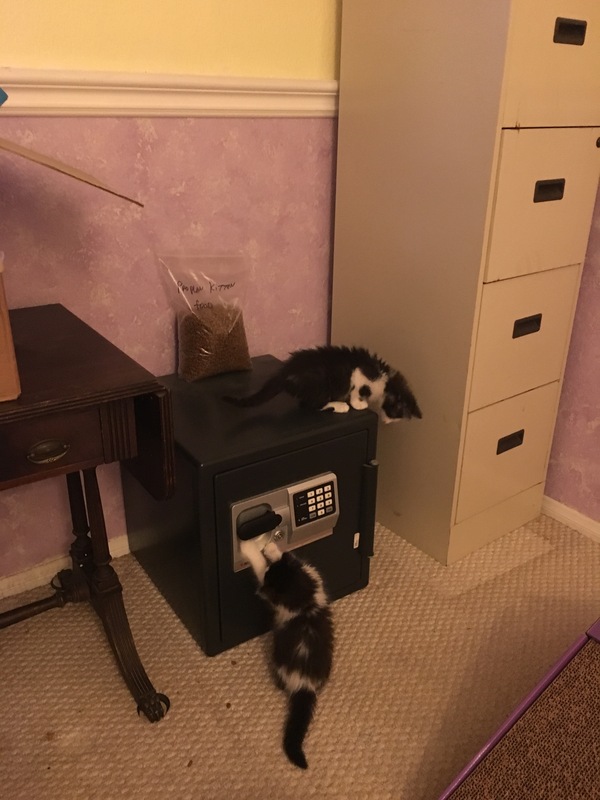 Can we borrow those safecrackers to see if they can help us get into the treats safe??? Hope you are doing better, Dennis. Wouldn’t that be funny if they hit the right buttons to pop the safe open? where is Dennis the watchdog??? Adorbs. And also…. that might come in handy! They got skilz. Looks like nothing is “safe” with those two in the house. Ohhhh Dennis they are your buddies fur sure!